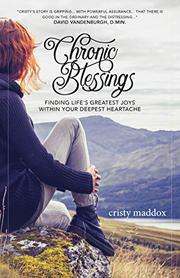 Maddox tells her story of keeping faith in times of illness in this debut Christian memoir. Maddox had a good life: Raised in a loving family in rural Virginia, she met her future husband on the first day of college. Even so, she found herself losing her strong Christian faith in her early 20s, feeling that God wasn’t talking to her the way he talked to her friends and fellow parishioners. As it turned out, God’s silence was just evidence that everything was going well, and she would hear his voice soon enough, during her struggle to get pregnant, two miscarriages, and the terrible grief she felt having to give up an infant she was fostering for 10 months. Through these times, Maddox’s faith in God grew, and so did her family. She and her husband, Greg, managed to have two sons and adopted a daughter from Rwanda. The greatest test still lay ahead of her, however: postural orthostatic tachycardia syndrome or POTS. It began with dizziness and numbness on the right side of her body: “In retrospect, Greg and I are probably a little too chill about things like this, especially with both of us working in the medical field. If this happened to anyone else, I would have told them to go to the emergency room.” As the reality of her new disease and the limitations it placed on her life began to sink in, Maddox doubled down on her faith and continued to find God’s lessons in the daily problems in her life. The author’s prose is taut and emotional, particularly when describing the effects of POTS on her life: “I’m crying because of how utterly helpless and pathetic I feel. I’m an adult who can’t figure out how to book a hotel! I’m an adult who can’t figure out how to use my phone to let my husband know what’s going on!” Maddox is deeply and unquestioningly Christian, and her fairly frequent conversations with God may turn off secular readers. Even so, her problems are real and rendered in detail, and the positive spin she is able to place on them is sincere and encouraging. An earnest, thoughtful reminiscence by a woman who found solace in a renewed relationship with God.